Brown ground chicken with onion and 3 tbsp chili powder. Place in slow cooker. 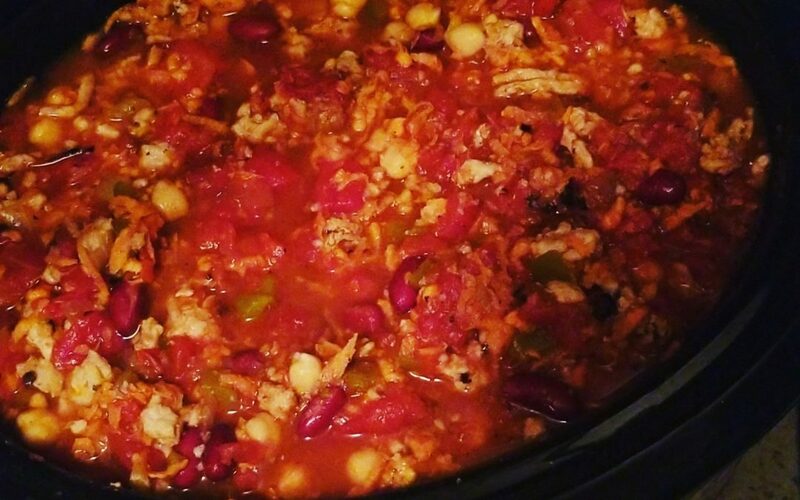 Add tomatoes, chicken broth, tapioca, soy sauce, oregano, onion powder, garlic powder, cumin, sweet potato, diced green chiles, kidney beans and chick peas. Stir to combine. Just before serving, stir in the remaining 2 tsp of chili powder. Season with salt and black pepper if desired. Top with cheese, green onions and serve with crackers. Enjoy!